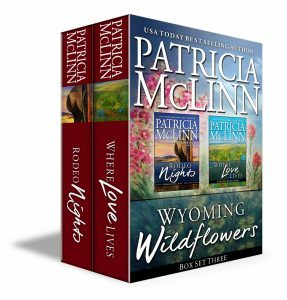 If you enjoy reading about strong women and the men who love them, you’ll love the acclaimed Wyoming Wildflowers collections of novels with touches of humor, now available in three boxed set versions. These moving, passionate contemporary Western romances revolve around the loves and lives of the good people of Knighton, Wyoming, including those who own the ranches and those in the little town who keep the health clinic, law office, diner, school and flower shop running. Below is a list of books within each boxed set. In parentheses are the specific wildflowers central to the theme of each book. All sets represent discounts compared to purchasing the books individually. Eight books: the series prequel, five central titles and two prequels that provide a backstory into the most recent novels. Perfect for readers who want their Wyoming Wildflowers in one neat boxed set — or for new fans who have dipped their toes into a field of wildflowers and now want to binge-read these stand-alone stories. A series catch-up for those readers who have read only the first books, this includes the five central titles and The Beginning series prequel. 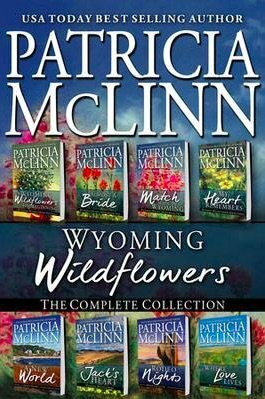 The original Wyoming Wildflowers set included the first three books I wrote in this series. Book 5, Jack’s Heart, and its prequel, A New World, in one convenient bundle. Book 6, Where Love Lives, and its prequel, Rodeo Nights, in one volume. Where Love Lives also is part of The Inheritance Collection, a multi-author group of 10 related stories.